For the first-time visitor to Okinawa, the more than 50 stores at Naha Aiport can present a bewildering array of choices. 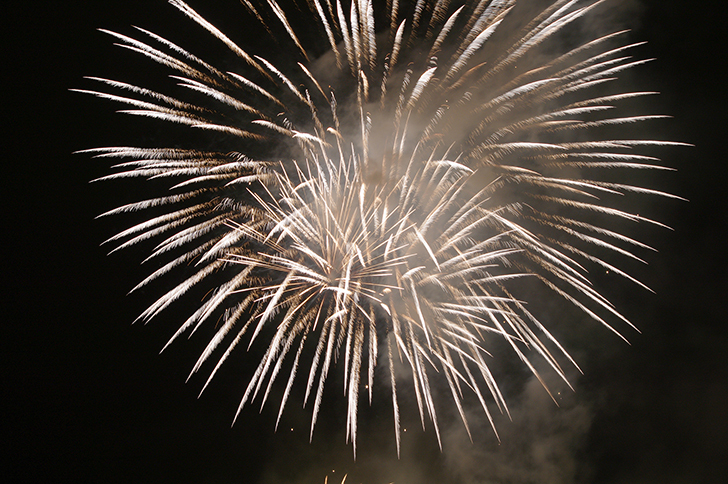 Here, we will introduce the standard gifts that are best suited for first-time visitors. To help you find them, we have also included the name of the store where each product is available. 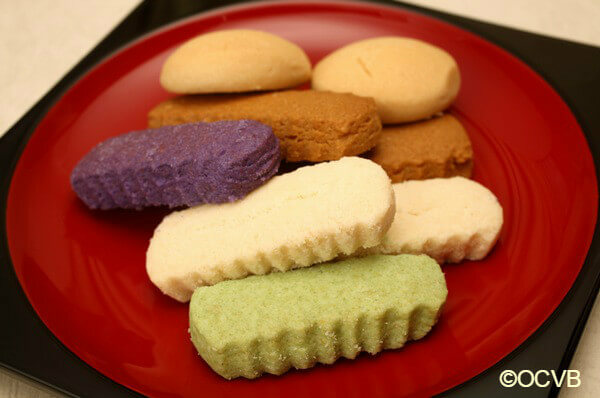 Chinsuko are some of the most well-known of the traditional Okinawan sweets. The Arakaki Chinsuko Flagship Store is particularly famous as a long-standing purveyor of these sweets. 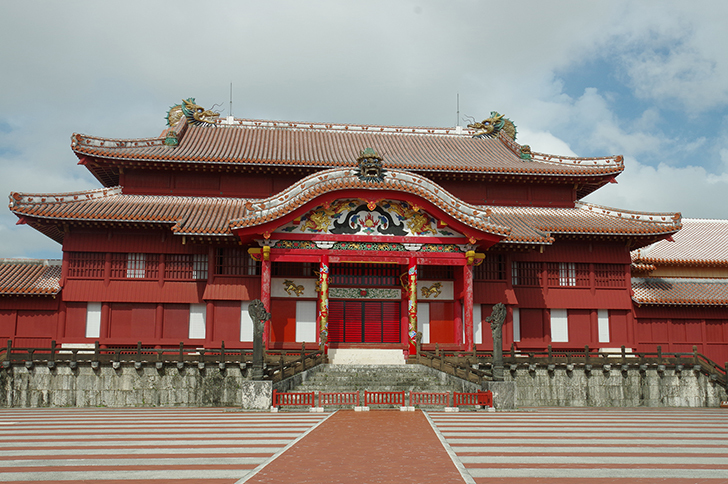 During the reign of the Ryukyu Kingdom, which lasted into the 19th century, this store is said to have served three generations of monarchs. Although Chinsuko were originally steamed, now it is more common to bake them. This store was the originator of the baked variant. The combination of flour, sugar and lard into a sumptuous confection means that munching on these sweets can become a difficult habit to break. In addition to the traditional plain version, there are now multiple flavors available. 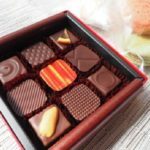 The cocoa flavor is particularly popular for its rich, decadent taste. 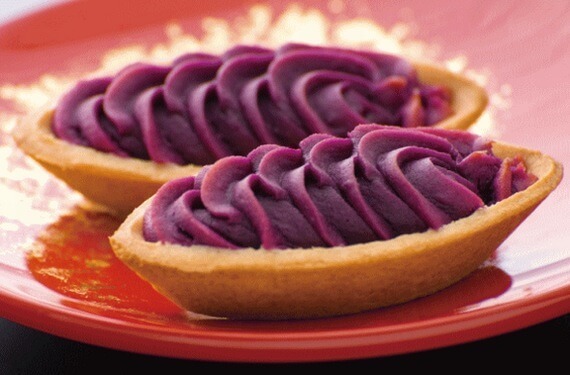 This treat is made using Okinawa’s distinctive purple sweet potatoes. 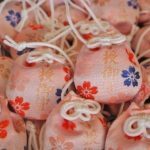 Along with Chinsuko, they are some of the most well-known Okinawan gifts. Their unique mix of sweetness and moist texture makes many shoppers come back for second helpings. Okashi Goten sources their potatoes exclusively from Okinawa Prefecture so as to bring out the full flavor of their Okinawan Sweet Potatoes. Their uncompromising attention to the appearance and flavor of their product comes through in their refusal to use preservatives or artificial coloring. The fragrant and moist tart dough is so delicious as to be addicting. Since they are sold individually at the Okashi Goten Corner on the second floor of the Naha Airport, you can try one out as a snack. 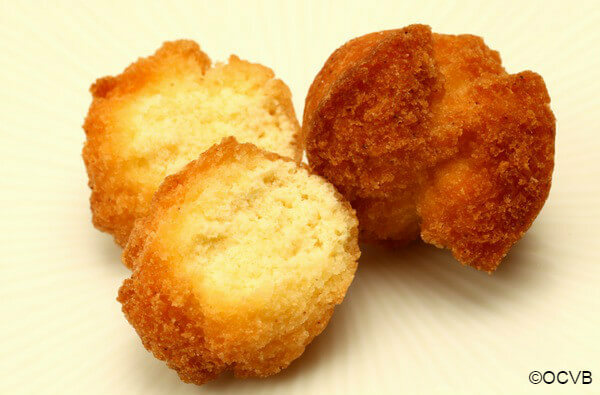 Sata Andagi (Okinawan donuts) are often made at home by Okinawan families. They are shaped as small spheres rather than rings. At the Ryukyu Village on the second floor of Naha Airport, you can try exquisite, freshly baked Sata Andagi. While tourists usually only get the chance to buy Sata Andagi at a store after they’ve cooled down, here you can get them in the state that a mother might make them for her children: just baked, piping hot, and still soft. Flavors include plain and brown cane sugar. 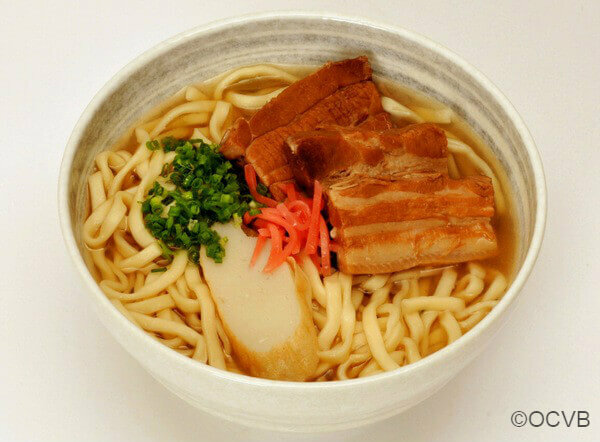 The characteristics of Okinawa Soba vary depending on the region. Although medium-thick crimped noodles are generally the most common style, flat noodles are preferred in Nago City while thin crimped noodles are the norm in Miyako Island and straight round noodles in Ishigaki Island. Terukina’s, in Naha City, is an especially popular noodle shop with a long history. The noodles are characterized by a chewy, resilient texture and crimped shape that helps them to mix thoroughly with the soup base, and they have a reputation for great flavor. Instead of going to their Naha store, you can buy fresh noodles from Terukina’s directly at the airport. 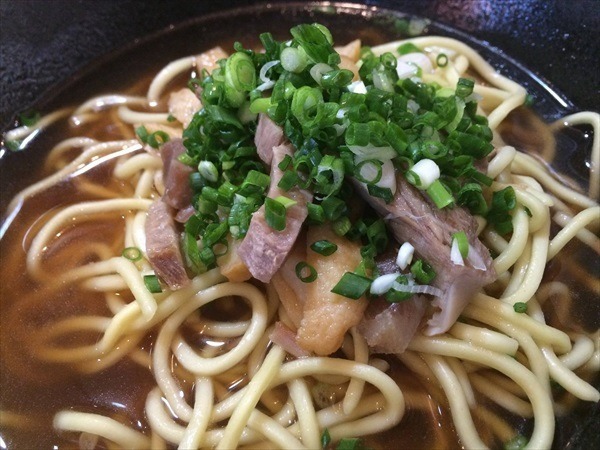 These noodles are a must for those who fell in love with Okinawa Soba during their vacation. 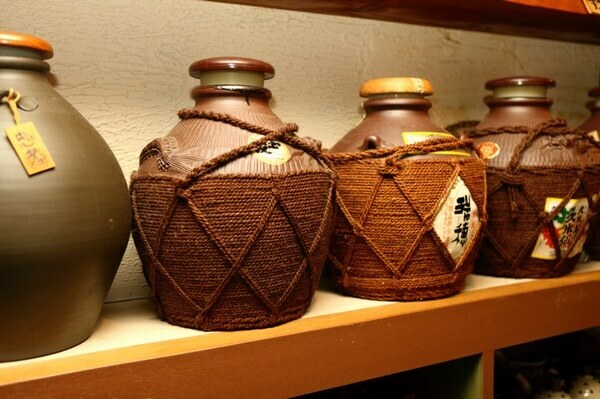 Awamori is a traditional Okinawan liquor. 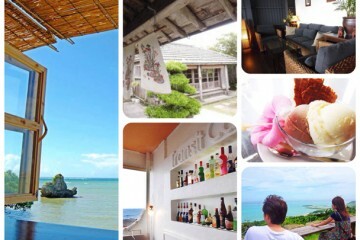 Today, there are some 46 Awamori distilleries in Okinawa, each characterized by their own unique flavor. 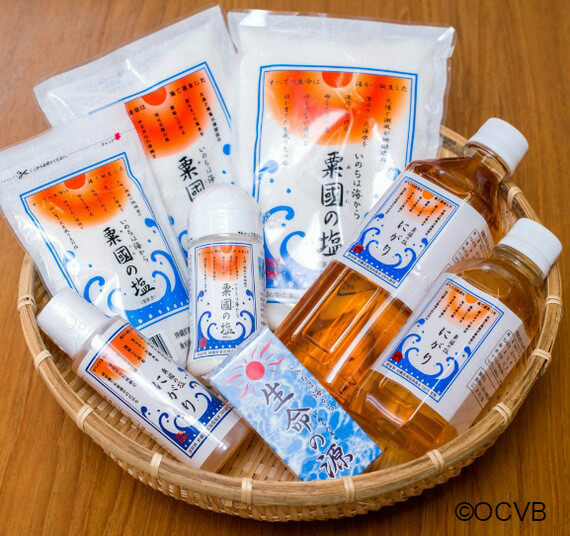 There are many places in Naha Airport where you can buy Awamori, and the airport’s original brand “White Tiger” is especially popular. The deep body and strong umami flavor as well as the refreshing aftertaste characteristic of this brand are made possible by patiently aging 100% Ryukyu Awamori. We highly recommend a taste test. 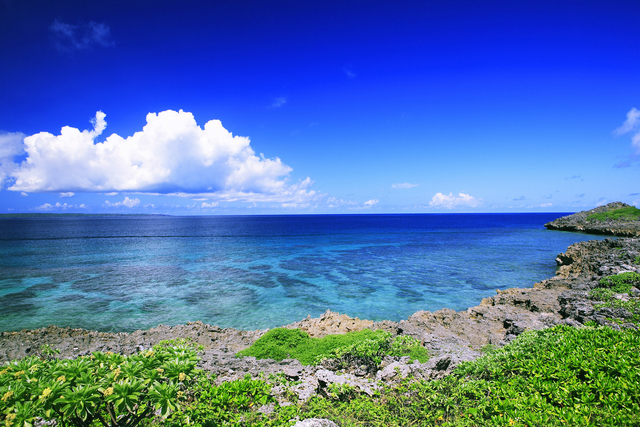 Okinawa is famous for its distinctive Ryukyu Glass. Although glass-making began in Okinawa more than a century ago, modern Ryukyu glass originates from the re-use of empty soda bottles brought in by U.S. troops after the war. By freely manipulating a blowpipe wrapped with molten glass, glassblowers can create everything from air pockets to uneven surfaces. The translucent hues and myriad textures can even be useful to decorate a room. 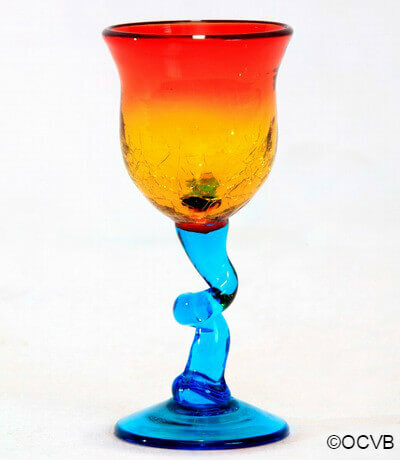 Naha Airport’s Rurian, a Ryukyu glass specialty store, stocks a rich variety of items ranging from cups to trinkets. Feel free to browse through the selection for a gift that fits your needs. 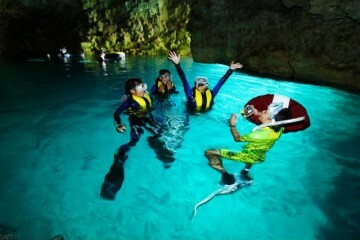 Aguni Island is a part of the Okinawa archipelago and is located some 60km northwest of Naha City. 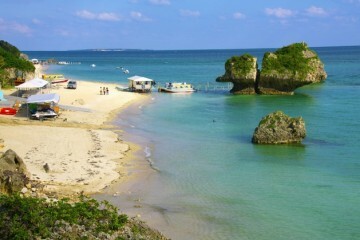 The Okinawa Sea Salt Research Institute, located on this island, produces both sun-dried and wood-fired sea salt. Aguni Sea Salt first received attention in Japan during the natural salt craze some years ago, yet this salt continues to win fans even today for its mild taste and abundance of minerals. It is a versatile salt that is well suited for use with meat, rice, pasta, or vegetables. Collectors of curios should check out the Yachimun, a name for a traditional craft that means “pottery” in the Okinawan dialect. 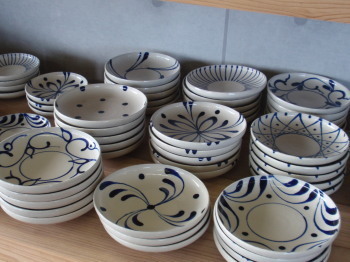 The large selection of Yachimun at the Naha Airport ranges from easily affordable pieces all the way to cups and dishware made by Jiro Kinjo, who is officially designated as a Living National Treasure. 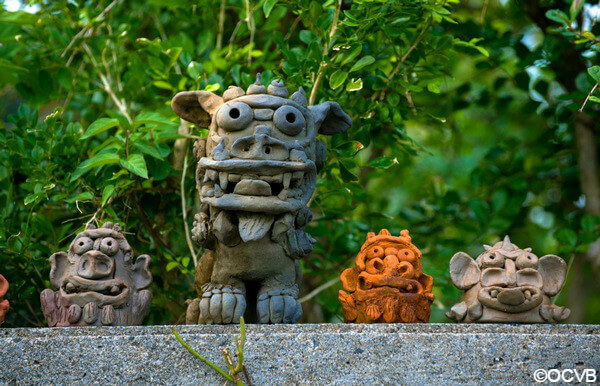 Shisa are Okinawan good luck charms that are traditionally placed on either side of a building’s entrance. 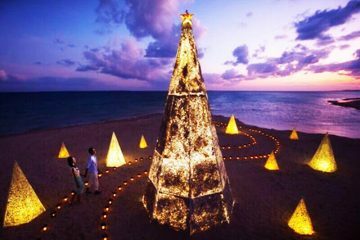 Used by the average household as well as in public spaces, Shisas are a familiar sight for the Okinawan people. 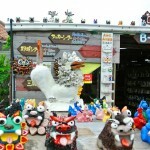 Due to their popularity as gifts and souvenirs, they are available for purchase in a variety of poses and facial expressions. 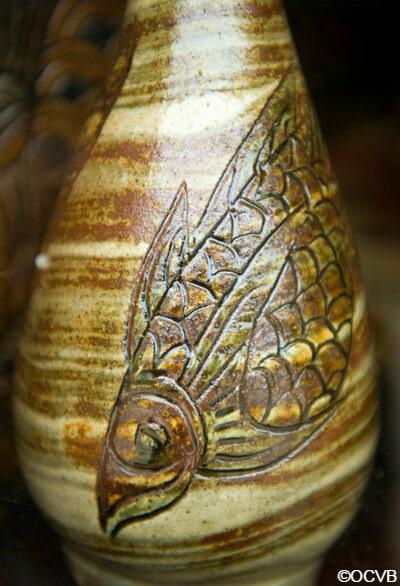 The Shisa produced at the Itoman Workshop, which is lead by the multiple award-winning artist Sakae Sakuma, are particularly notable for their cute and rustic designs. 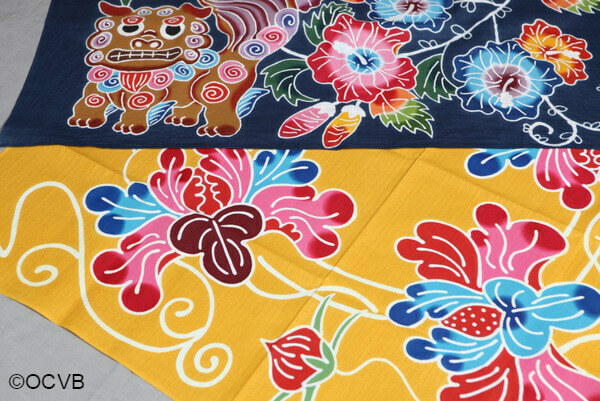 Bingata are traditional Okinawan dyed fabrics that were used to make dance costumes during the Ryukyu Kingdom period. Characterized by bright primary colors as befitting a tropical island, the fabric is now used for all kinds of applications. A particularly popular gift idea is the Bingata hand towel. Along with their bold designs, their ease of use is also a selling point. 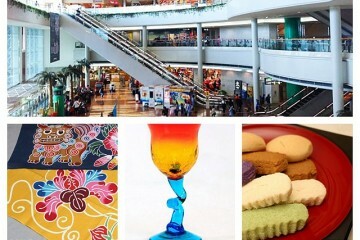 Sold at many gift shops in Naha Aiport, you can also choose from a selection of T-shirts and Japanese wrapping cloths. 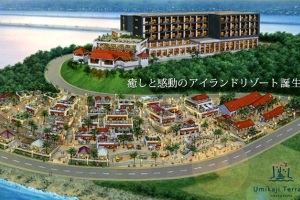 The temptation while traveling in Okinawa is to buy incredible souvenirs at every place you visit. 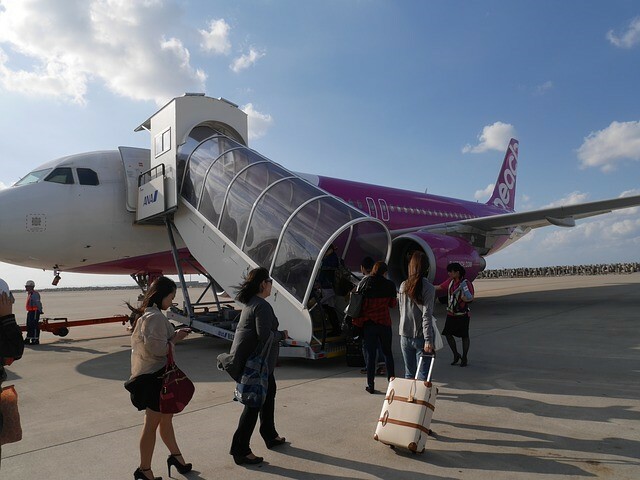 Yet many of these same items are also available at Naha Airport. Buying them at the airport at the end of your trip rather than partway through also has the advantage of saving you from having to carry around extra luggage. 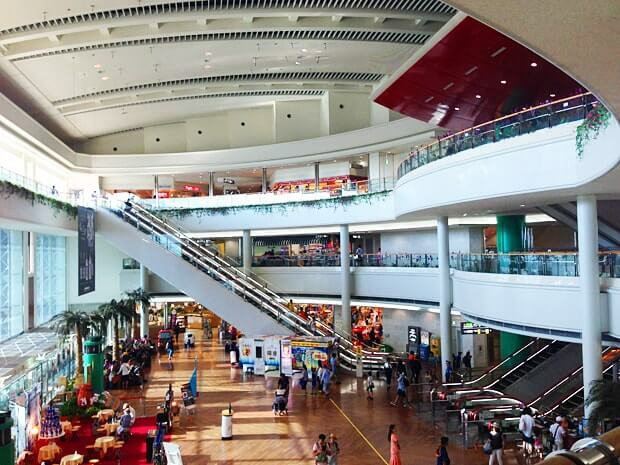 So set aside a little time on your last day to browse the stores at Naha Airport while savoring your memories of Okinawa. 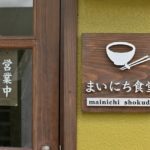 Experience of making Benimo Sweet Potato Tart in Okashigoten Onnason Store! 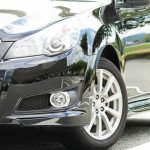 Basic Information When You Do Car Rental in Naha Area! Raise your luck with cute protective charms! 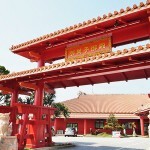 A matchmaking pilgrimage to Okinawa’s history-rich Shrines!